In classical antiquity it was believed that the soul left the body in the shape of a butterfly. The soft fluttering of a butterflies wings, like the flickering brightness of flame, was a symbol for the lightness of wandering spirits that would pass through the underworld on their night journey. 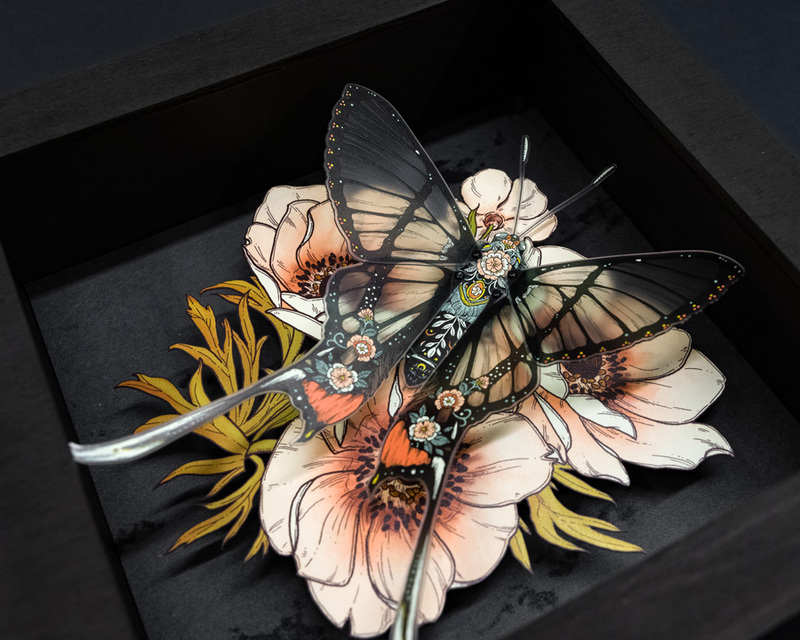 Featuring a solid black wood frame, each specimen features a delicately pinned butterfly with transparent wings articulated to reflect real butterfly’s wings. Mounted on a black background with raised levels of flowers and glittering celestial bodies, each shadow box enchants from every angle. Moths, sometimes known as night butterflies, are the constant symbol of the soul seeking divinity and consumed by mythical love. In some cultures they are seen as symbols of humanity in darkness. The Death’s Head Hawkmoth is unique among moths not only for it’s unusual anatomy and the unsettling mouse-like squeak it produces, but for it’s almost universal association with the supernatural and evil. The latin names of these dark omens all stem from greek words for death, including Moirai, one of the tree entities who cut the threads of life to all living beings separating their souls from their bodies and sending them to the underworld.